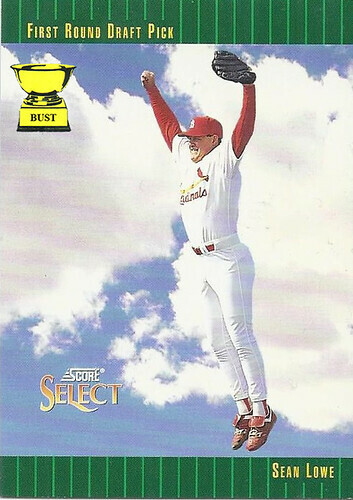 St. Louis Cardinals' scouting report on first-round pick Sean Lowe: "Well, it's pretty obvious, but the sky is the limit with this kid — and it looks like he has reached his limit. ... Can't pitch worth a lick, but his vertical leap is 122,816 feet. ... His baseball IQ isn't that high; his head seems to be in the clouds. ... If that trampoline rule change comes to pass, this kid will be a star. ... His apparent ability to fly bodes well for a team with a bird for a mascot."